The sound experience which I prefer to all others is the experience of silence. And the silence, almost everywhere in the world now is traffic. If you listen to Beethoven or to Mozart, you see that they are always the same. But if you listen to traffic, you see it’s always different. To know whether or not art is contemporary, we no longer use aesthetic criteria (if it’s destroyed by shadows, spoiled by ambient sounds); (assuming these) we use social criteria: can include action on the part of others. Kunsttunnel (“Art Tunnel”) Augsburg is a project by the local community volunteer network Bündnis für Augsburg (www.buendnis.augsburg.de). 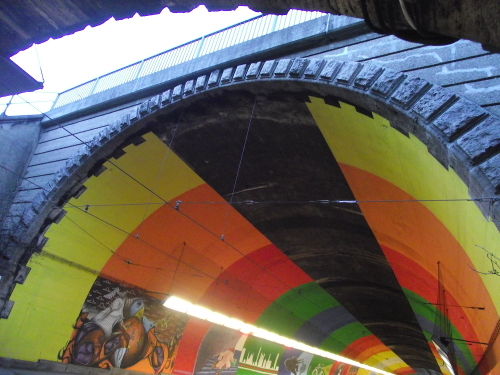 Inaugurated in 2003, the project has turned Pferseer Unterführung, a street underpass with lots of traffic beneath the tracks of Augsburg’s main railway station, into a showcase for graffiti art and murals. To provide an acoustic enhancement to the noisy surroundings, music by Mozart had been broadcast round the clock since 2003 in the then separate pedestrian tube of the tunnel on a multi-speaker sound system designed and built by Wolfgang F. Lightmaster and operated in a closet at the centre of the tunnel. 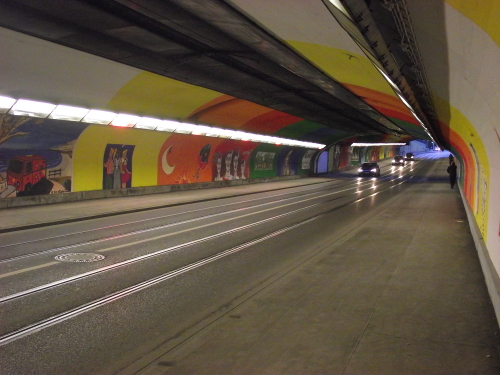 When the wall that used to separate the pedestrian path from the car traffic in the road was torn down in 2012, the acoustics of the tunnel changed, and Mozart was practically drowned out by the traffic except in very quiet hours of the night. This is why in the autumn of 2012, a new daytime sound exhibit for Kunsttunnel was developed. This installation called “Private Transport” by Gerald Fiebig and Alexander “Poembeat” Möckl was inaugurated in November 2012. It makes use of the existing sound system, but works with the traffic noise instead of against it, a method pioneered in 1977 by Max Neuhaus’s sound installation “Times Square” at the New York location of the same name. Fiebig and Möckl developed a drone sound based on intervals of only two tones (A and B for AugsBurg) which subtly, almost subliminally intermingles with the sounds of the traffic, thus giving an aesthetic frame to this ‘noise.’ The title “Private Transport” refers not only to the dominance of cars (as opposed to buses and tramways) in the tunnel, but also to the shift in listening attitudes made possible by this implicit musicalisation of the traffic. The sound coming from the speakers, hidden from view, forms part of the overall acoustic ambience of the tunnel. It invites passers-by to focus on the potential aesthetic pleasure in the infinite variations in the sounds of traffic, as if on a piece of music. “Private Transport” is not a fixed composition, but the name that could be given to the individual mix of soundtrack and ambient sounds that each passer-by creates in their listening mind as they pass through the tunnel. This processual, interactive aspect of the sound work corresponds with the changing nature of the visual artworks in Kunsttunnel, as new volunteer artists keep adding new works while others are painted over. 20’00 This track is licensed under a Creative Commons licence. Tracks 1 to 5 document impressions from the installation at various times of day, recorded with a pair of OKM-II in-ear microphones by Soundmaster on a Zoom H2 recorder while walking through the tunnel and edited with the Audition 3.0 software. Track 6 documents an encounter with a passer-by during one of the recording trips. Track 7 is a 20-minute loop from the soundtrack playing at Kunsttunnel Augsburg. You may use it under a Creative Commons licence to create your own “Private Transport” at a noisy site of your own choice by referencing the title and authors. More details can be found by clicking on the licence link above. If you do use the material, we would be very happy for you to contact us at geraldfiebig(at)aol.com. A new release of the Field Recording Series, this time with Gerald Fiebig, sound artist and Alexander Möckl, producer, composer and guitarist, both based in Augsburg, Germany. 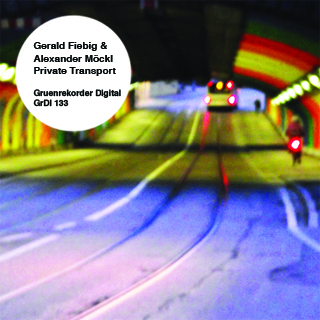 They worked together on the installation ‚Private Transport‘ consisting of traffic recordings which was released by the German Gruenrekorder label in a digital edition with the same title which consists of seven tracks. 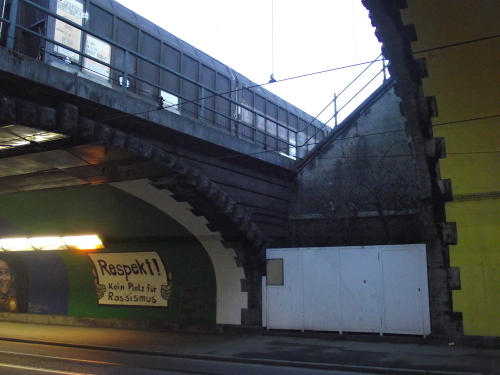 ‚Private Transport‘ is a sound installation which opened in November 2012 in a street underpass called Kunsttunnel in Augsburg. Before this installation Motzart’s music it was broadcast through the same sound system. Traffic noise is the acoustic environment of the tunnel and passers-by can listen different variations in traffic noise and thus develops its own sound experience. This interactivity between the passer-by and the sound – which also has a very subtle drone as a backdrop – shows the changing nature of visual art works in Kunsttunnel, while volunteers continue adding new artists works, others are painting over them. “Private Transport” was firstly the name of the installation. The piece operates between the traffic and a drone sound in an Augsburg tunnel’s. Before “Private Transport” and for provide an acoustic enhancement Joannes Chrysostomus Wolfgangus Theophilus Mozart was broadcasted on the multi-speaker sound system designed and built by Wolfgang F. …..So we can easily imagined what was the result…..But, and by a lucky break, the wall used to separate the pedestrian path from the car traffic was torn down. In November 2012 Gerald Fiebig and Alexander “Poembeat” Möckl was inaugurated “Private Transport”. This soundtrack is so a trace of a concrete space, with random data. One of the first impression at the listening is the depth, moving depth …..
Look at the sounds startes articulatory. Foreground, car traffic : white noise variations, air volume variations moving, motor power variations, flux variations (of traffic). Middle ground, life noises : humain voices, birds, etc. Background sound : the drone based on a variation of two tones that repeats over time. The result is really contemplatif, a game with the real flux of our life (of modern human). The traffic (motors, pedestrians, animals) is assimilate directly to the composition. And we can ask, why it works so well ? My opinion is this is precisely because the sound addition (the drone) is not brought to the foreground ; as to mask the traffic noise ; but instead to the background. In this way the sound life can live without any confrontations and allows to the composition to fit into the flow of present.